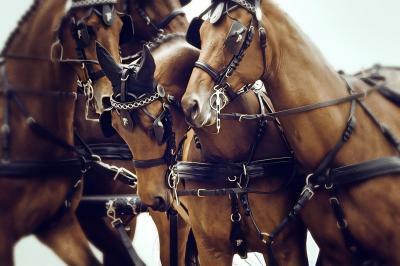 Monica Stevenson is a photographer with an unbridled affinity for capturing the equine tradition. Her memorable images reflect a singular vision and creativity that transcends print; bringing to life the energy felt in the barn, the field, and the arena. Her seasoned approach to lighting and artful composition engender a technically sound dynamic to images that reflect both the enduring romance of equestrian heritage and a creative, modern curiosity. Whether photographing the Arabian flat racer, Olympic stadium jumper, or wild Camargue, Stevenson is anything but green in her approach to capturing the cadence of the horse or the accoutrement of its rider. Stevenson’s new work is an exploration of the tactile and uncannily artistic array of visual details that materialize if one looks and “sees” in a particular way. The oft-overlooked dance of water and froth, the chaotic tumble of colliding horses, the convolutions of exercised flesh, and the sculptural experiments with hair and metal—all these combine to make a collection of photographs that celebrates the delightfully sensory nature of the equine world which we have chosen to inhabit.